How to Create Joy & Passion in your Workplace and Career! 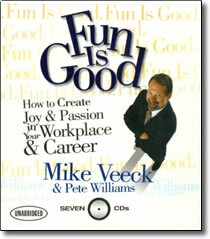 Maverick marketing whiz Mike Veeck offers you his simple, no-fail formula for business success! Drawing on his own experience and the success stories of clients and others who have benefited from his philosophy, Veeck shows how fun, creativity and passion can bring out the best in an organization and an individual. The Fun Is Good philosophy applies to everyone, whether you’re the CEO or lower on the totem pole. You’ll see how laughter can be the key to turning a floundering business into a profitable one and how it can easily jump-start a stalled career. A breakthrough, one-of-a-kind approach to job fulfillment, FUN IS GOOD can help all of us get the most out of our work lives both in and out of the office.